I've always been addicted to summertime, with it's ninety degree temps and ample sunshine, but Fall is slowly becoming my favorite season. My next house project will be tackling the front porch. We currently have broken furniture sitting by our front door. It's an embarrassing first impression! I've been giving a co-worker a ride to work this week and he just bought a new house in our area. He was talking about buying a new master bedroom furniture set in white, and I strongly advised him not to go with the upholstered headboard. For starters....they are overpriced if you buy them from a store like Pottery Barn. I was lucky and found our upholstered headboard at the flea market for $100, but in hindsight, I would not go the upholstered route. Within a year, it was dirty and they are impossible to clean!!! Any creative suggestions on how to clean this? I've Googled everything and can't find a solution. Luckily it's not too noticeable, but it's still annoying. My advice: Don't get one! Well, it's been a busy week, but I'm excited to relax tonight. I've been reading "The Shining" by Stephen King, and I'm hooked. Nothing on the agenda tonight except cooking dinner and relaxing on the couch with my book. 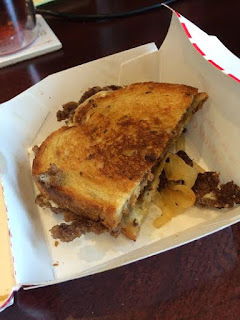 I first heard about Freddy's Frozen Custard & Steakburgers from a Pioneer Woman blog post. I made the Pioneer Woman's "Freddy's Burger" recipe on our stovetop griddle a few weeks ago. 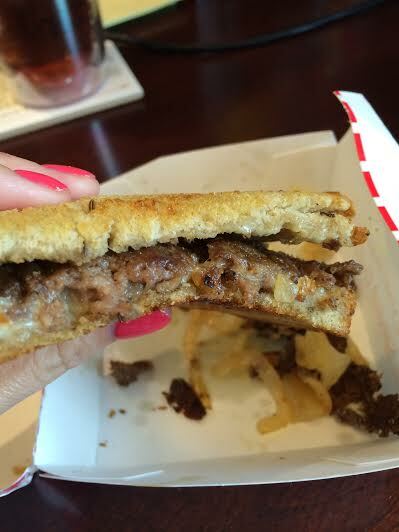 Basically, you just press the hamburger patties very thin and melt American cheese between the two patties. It's also crucial to use cheap hamburger buns that are slightly toasted with lots of butter. Sounds healthy, right? The concept is basically the same as Steak & Shake. 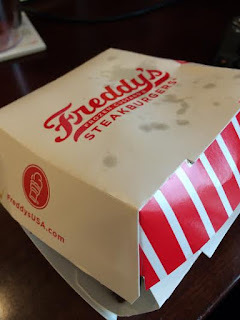 I had never heard of Freddy's before reading her blog, so I assumed it was an Oklahoma thing, or maybe just a chain that's specific to the Southwest. I was so excited when I drove by a brand new Freddy's restaurant in Durham, NC! I had to return some clothing I ordered from Old Navy today on my lunch break, so I was driving right past Freddy's. I decided to give it a try and see if it was really as good as the Pioneer Woman said it was. I should have ordered their classic burger, but instead I went with the Patty Melt. It was not as good as Steak & Shake. Also, they lose a few points because I had to say "sweet tea" three times before they understood what I meant. When I pulled away from the drive-thru kiosk after I ordered, I heard the employee ask someone "Do we have sweet tea?" LOL! He must not be from North Carolina. 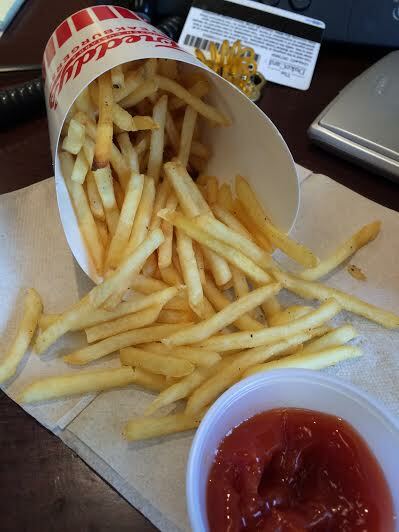 The french fries were OK. The employee asked if I wanted any of their special "fry sauce," which he told me it was a mixture of ketchup, mayo, and pickle juice. I tried the sauce, but didn't like it. As you can see from my picture, I used plain ol' ketchup. So that's my Freddy's review. I'd be willing to go there again, but it did not meet my expectations. A couple weeks ago I was giving relationship advice to my sister and I felt like an expert on all things marriage. The very next day, however, I was so frustrated with Brian that I couldn't even think straight. I was feeling angry, and hurt, and bitter, and defeated. I was ready to swear off marriage and live the rest of my life being single. (I think it's already been established on this blog that I have a flair for the dramatic). So that's my disclaimer. I'm the last person in the world that should be dishing out marriage advice. One day I'm up and the next day I'm down. In May 2013 during a sermon at church, the pastor challenged every husband and wife to take time out of their week to write down 10 things they loved about their spouse and give the list to their spouse before the next Sunday. At the time, I didn't think much of the assignment. I wrote down my list of "Ten Things I Love About You" in a little notecard and gave it to Brian early in the week. 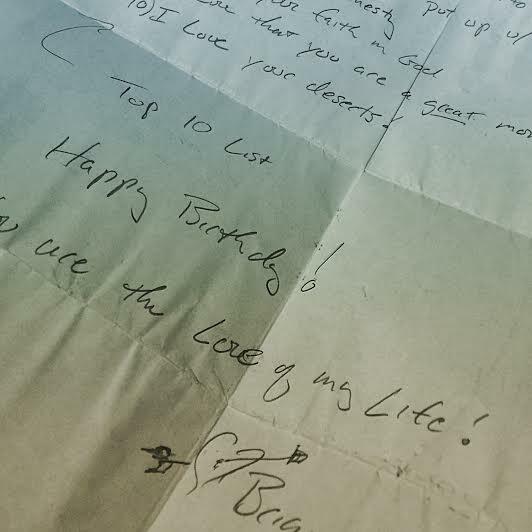 As the week passed, I was convinced Brian was not going to give me a list of ten things he loved. I was sure he had forgotten about it. Brian is a typical guy, so I figured romantic list-making wasn't a high priority for him. Much to my surprise, at the very end of the week - LOW AND BEHOLD - I got my list. 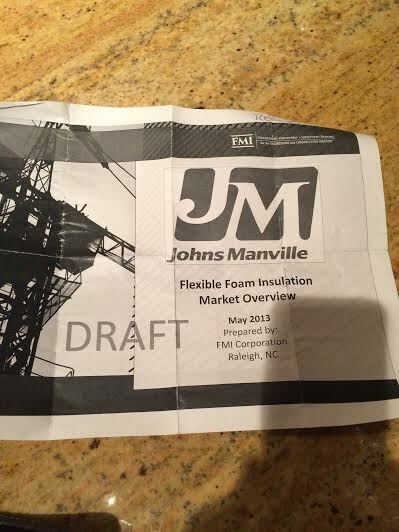 I woke up Sunday morning and there it was - 10 things that Brian loved about me scribbled on the back of a Flexible Foam Insulation Market Overview. Maybe it was the boredom of flexible foam research that inspired him to make the list, but I was just happy he had remembered. It was a very nice list. I folded it up and stuck it in my wallet. On days when I'm feeling angry, and hurt, and bitter, and defeated, this list has been a lifesaver. In desperate moments when I don't feel loved or appreciated, I'm reminded that "this too shall pass." I would highly recommend you make a similar list for your spouse, even if your pastor didn't give you this assignment and even if you know your spouse won't give you a list in return. Expect nothing from other people and much from yourself....my personal philosophy. Plus, making the list serves two purposes. You're letting your spouse know 10 reasons why you love them, while reminding yourself of 10 reasons why you love them. Because let's be honest, there will be days when it's hard to come up with just one reason why you love your spouse, much less ten. There will be days when you'll need to resort back to a list you made in 2013. Just take it from me. The relationship guru. I failed last month's "blog every day" challenge. 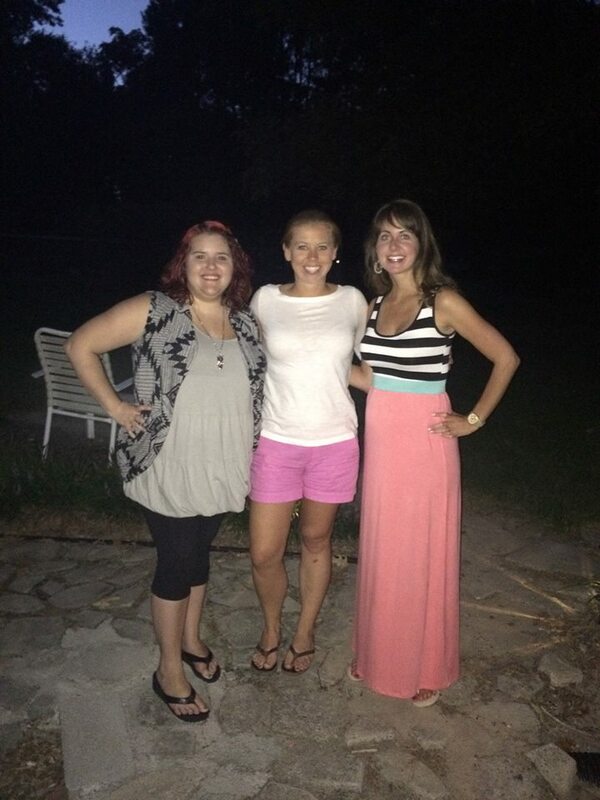 One of my best friends is moving away this week, so we had a farewell cookout last weekend. Luckily, she'll still be in North Carolina, so I think there will be a weekend road trip in my near future once she's settled in to her new place. Remember the succulents Brian got for me a couple months ago? Apparently succulents do not thrive on neglect. I think they survive best in desert climates, with ample sunlight and dry air. Basically the opposite of our dark and humid house. I'm going on Week 25 of pregnancy, so just a couple weeks away from the third trimester! Still feeling great and going along with life as normal. The only shopping I've done at this point is at a kid's consignment sale to buy used items and clothing. My co-worker also gave me lots of used baby stuff that her grandkids have outgrown. I really want to keep the baby spending to a minimum, so I'm all about getting used stuff for cheap. I also don't want to fill up our house with baby junk (plastic toys, etc), so I'm trying to stick with the necessities. We've had a relaxed weekend, and today is my day for laundry, grocery shopping, and a few errands. I've also been trying to go to the gym more lately, so hopefully I make it there this afternoon.